We have some great specials for the month of November! YOUTH CLASSES ARE IN SESSION! If the monthly membership isn’t a good fit, try signing your child up for an 8-week session. For $100, he or she can come to UNLIMITED classes for 8 weeks. The first class is always free, so check out our schedule and come in to try us out! You’ll be pleasantly surprised at how much fun your kid(s) will have. More about our Youth Programs. 50% OFF ALL APPAREL: We are making room for hoodies and other cold weather items in the ATTHD Shop! 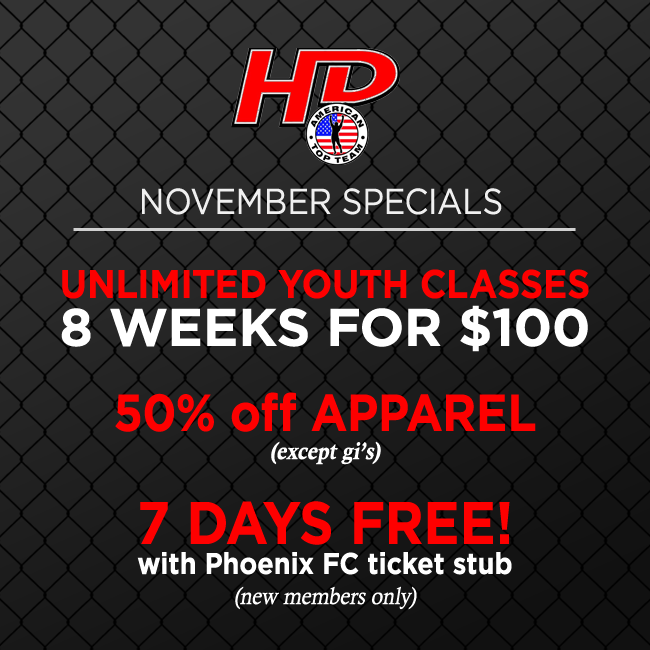 So come in and take advantage of a 50% discount on all current apparel (except gi’s). Don’t wait any longer! Stop in and check out these specials and ask us any questions you have. Or call us at 913-428-8420. You can also reach LC, Jason or Wes at info@americantopteamhd.com. Current Members: Don’t forget that you will receive 50% off your next monthly payment when you refer a friend or family member. Bring them in for their free class or better yet, give them your ticket stub from Phoenix if they don’t have one, and get them in the gym to try out some classes!